The site is located on Cambuslang Road in Rutherglen, Glasgow. The site historically comprised of a laundry facility (including dry cleaning capabilities), a lorry yard and a timber treatment facility. The identified contamination on the site reflected the diverse nature of the historical activities on the site. The identified pollutants included chlorinated hydrocarbons in concentrations exceeding 10,000ug/kg (laundry), petroleum hydrocarbons in concentrations exceeding 12,000mg/kg (lorry yard) and tributyltin (timber treatment facility). The site was being developed by Lidl as a retail store with associated car parking and hard-standing – it was therefore considered that the risks to human health would be addressed by providing a ‘pathway break’ and by the implementation of necessary gas protection measures within the retail store building. The prime environmental concern was the protection of the water environment. There were two identified receptors – the Scion Burn which was flowing through the centre of the site in a box culvert and the River Clyde to the north of the site. The River Clyde was considered to be prime receptor for the area as a whole (groundwater flows were assumed to be in a northerly direction as a consequence). The Scion Burn was considered to be of prime importance as the box culvert was clearly damaged in a number of locations and as a consequence there was every possibility that the burn was being directly impacted by contaminated groundwater present on the site. It was also evident that the flow of the burn was being constrained by blockages (primarily caused by the brick culvert collapsing in places). It was therefore an implicit requirement of the remediation works that the culvert was repaired / replaced to protect the Scion Burn from the risk of contamination and to enable the burn to flow through the site without constraint. 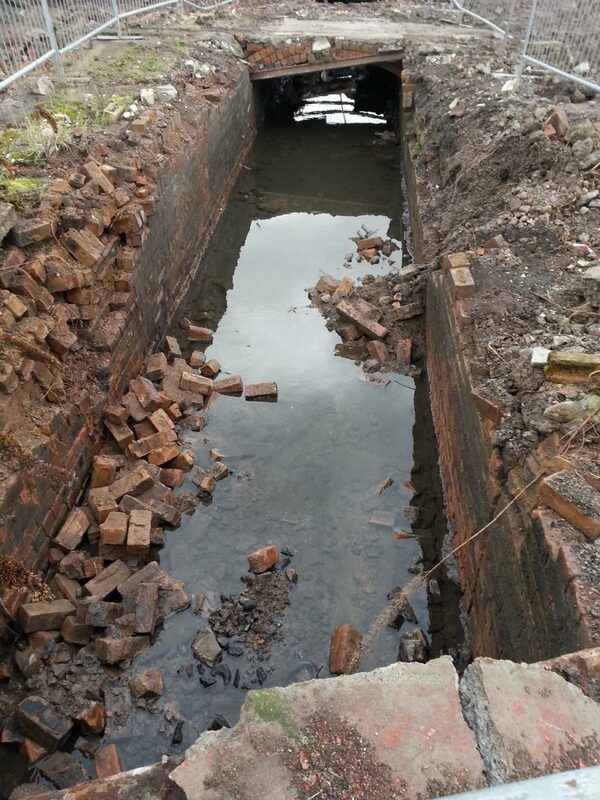 It was considered that the box culvert could not be economically or practically repaired and it was therefore decided to replace the culvert as part of the remediation works. The culvert was also realigned with the approval of SEPA to enable the store development to proceed. regulatory bodies (South Lanarkshire Council and SEPA). The approved remediation strategy involved the excavation of contaminated soils and associated groundwater, ex-situ treatment by E-Clay Stabilisation and re-emplacement following successful validation. Mason Evans Partnership was engaged by Lidl to provide an overall supervisory role for the remediation works. This included groundwater monitoring post remediation to confirm compliance with the designated remediation target criteria for the site.